Add a little dimension to your yard, and maybe a little oasis too, with stacked walls and islands from Mansfield Landscaping. Hardscape elements such as stacked walls is that they are so versatile: They work by themselves as simply a border to a garden bed, or can easily blend with other non-plant pieces of a landscape. Give Mansfield Landscaping a call today and get your free estimate on the construction of landscape stacked walls and islands. I have always had a positive experience with Mansfield Landscaping. We shopped many potential landscapers and none of them had the industry knowledge and level of customer service I received from Manfield. Additionally, we have continued to have great service by this crew AFTER we paid them, and to me, that is the true test of a good company. I recently had my villa landscaping done by Steve Mansfield and his crew. They worked hard for 3 days and did an excellent job. I am very happy with the job and everyone who has seen it has told me it looks great. 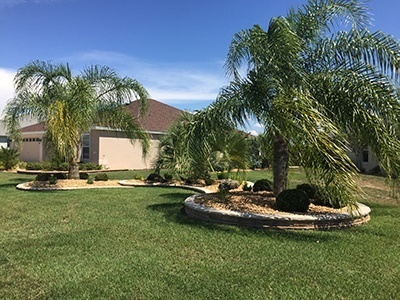 I was quoted 20-30 plants but was given many more to make my property look great at no charge. I was so surprised when Steve called to tell me he was having my driveway, walkway and patio power washed so that the dirt from their work would be cleaned up. True to his word, he sent someone over to do the work and not only does my property look great, but he also cleaned the street where there was dirt from the rock piles. I would recommend him to anyone looking to have their landscape done immediately and done well.